The FAMIUM DAI Service is an end-to-end solution for ad-insertion in MPEG-DASH and HLS. Our flexible technology is composed of multiple micro services, that can easily be deployed and integrate well with existing components and stream delivery infrastructures. 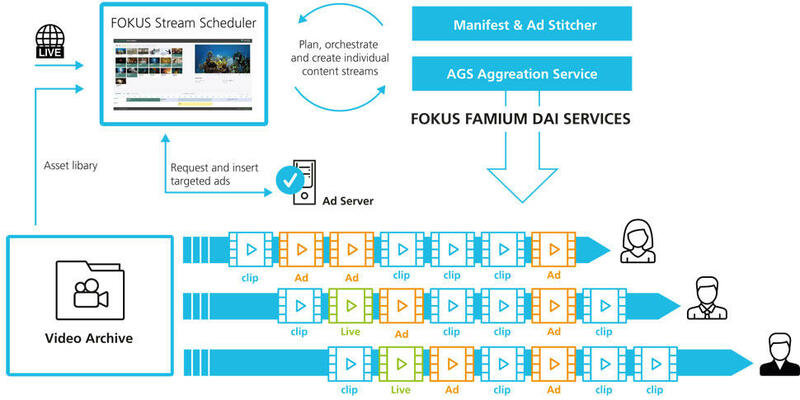 Acting as a delivery middleware, FAMIUM DAI wraps the complexity of the ad-insertion process into easy to implement tools, which are manageable through the FOKUS Stream Scheduler. It supports different ways of ad insertion, namely server-based and app-based ad insertion. The service covers the latest MPEG-DASH ad-insertion techniques like XLink and DASH inline and inband events. Moreover, it has support for ad signaling mechanisms like SCTE35 and ad server standards like VAST, VPAID and VMAP. Our tools can be used to target different platforms, including HTML5 browser, HbbTV 1.5/2.0 devices and native DASH and HLS player running on e.g. Android, iOS, FireTV or Chromecast. 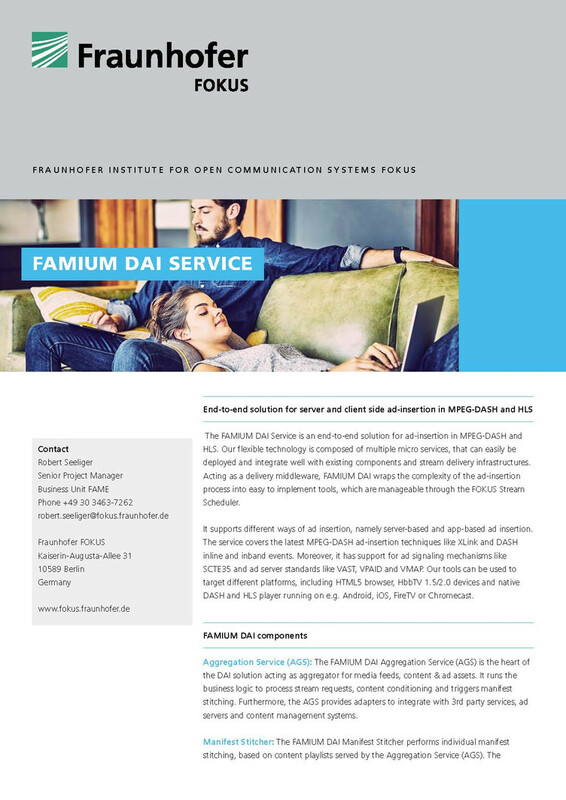 To stay updated on the latest developments of FAMIUM DAI Services and news of Fraunhofer FOKUS FAME, please subscribe to our newsletter. The FAMIUM DAI Aggregation Service (AGS) is the heart of the DAI solution acting as aggregator for media feeds, content & ad assets. It runs the business logic to process stream requests, content conditioning and triggers manifest stitching. Furthermore, the AGS provides adapters to integrate with 3rd party services, ad servers and content management systems. The FAMIUM DAI Manifest Stitcher performs individual manifest stitching, based on content playlists served by the Aggregation Service (AGS). The component creates MPEG DASH and HLS manifests on an individual, per client basis on the fly. The Manifest Stitcher supports multiple manifest variations corresponding to use cases as static playlists, linear playlists, live playlists and mixed VoD and live input sources. FAMIUM DAI leverages the monetarization of large content libraries through personalized and ad-enabled content streams. VoD-to-Live workflows allows the creation of orchestrated linear content channels out of the vast available VoD titles in large content libraries, which are normally not found and watched by viewers. Our FOKUS Stream Scheduler provides an easy to use tool that straight forwardly integrates with existing content stores and workflows to plan, create and deliver individualized content streams with targeted ads to your customers. As the solution works on manifest level, supporting MPEG DASH and HLS, it seamlessly integrates with established content delivery networks and playlist scheduling like Media RSS feeds (MRSS). If required, content conditioning is supported as well. Our solution enables dynamic ad insertion and flexible over-the-top streaming workflows including VoD-to-Live services across a multitude of devices and platforms via MPEG DASH, HLS and HbbTV. Dynamic digital video advertising can be integrated per user and in real time, in both traditional linear and on-demand content. 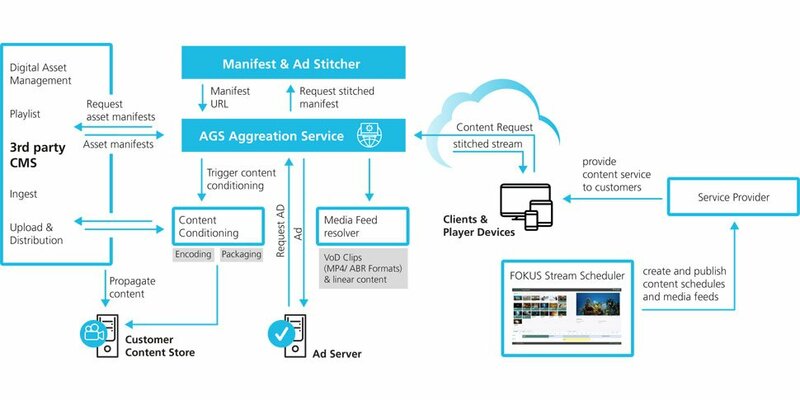 Content manipulation and dynamic ad insertion is powered by the FOKUS components Manifest Stitcher and Aggregation Service, operating on manifest level in a highly flexible and scalable system architecture. Individual stream management and channel orchestration is available via the FOKUS Stream Scheduler.